We have about ten projects at any given time. Read on to learn more about our process as we highlight five of our current projects. 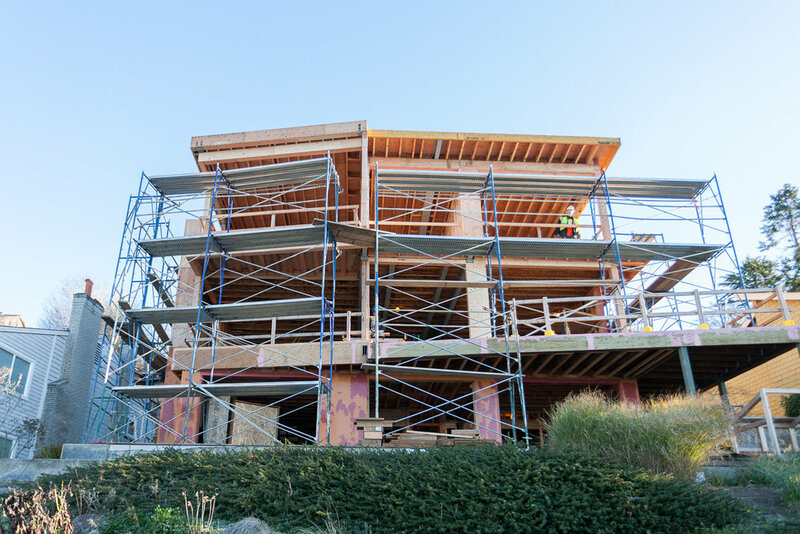 Above: This three-story residence, designed by Coates Design Architects, is emerging from the waterfront in Magnolia. Dovetail's framing crew is nearly finished combining the steel and wood structural package. Because the roof is 35 feet in the air and the exterior is mostly glass windows, we've reinforced walls with steel to add rigidity and transfer any seismic load. 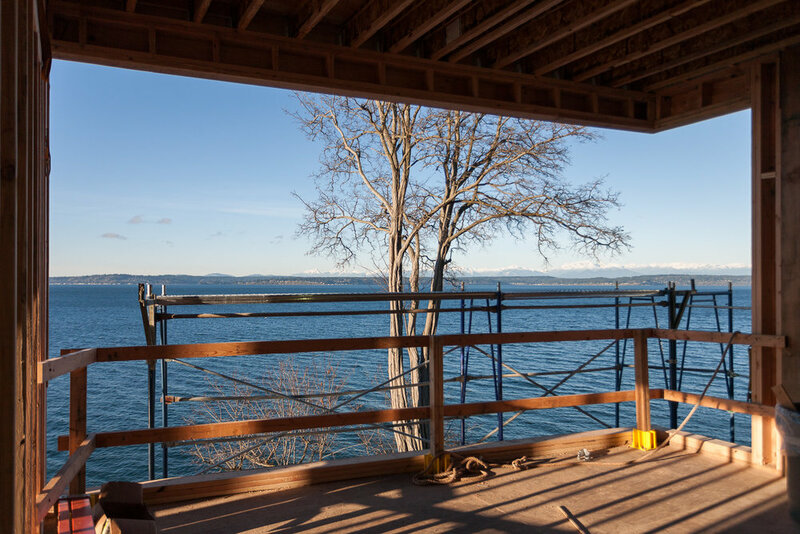 Far left: A room with a view - the master bedroom has beautiful views of Puget Sound and the Olympics. Middle left: Framing superintendent Chris Mega applies sheathing. Middle right: The framed master bathroom between the two bedrooms on the third floor. Far right: Ray Sumaniaga and Justin Sabala frame stairs to the upper level deck. The historic renovation of Harvard Exit, designed by S+H Works, is well underway. 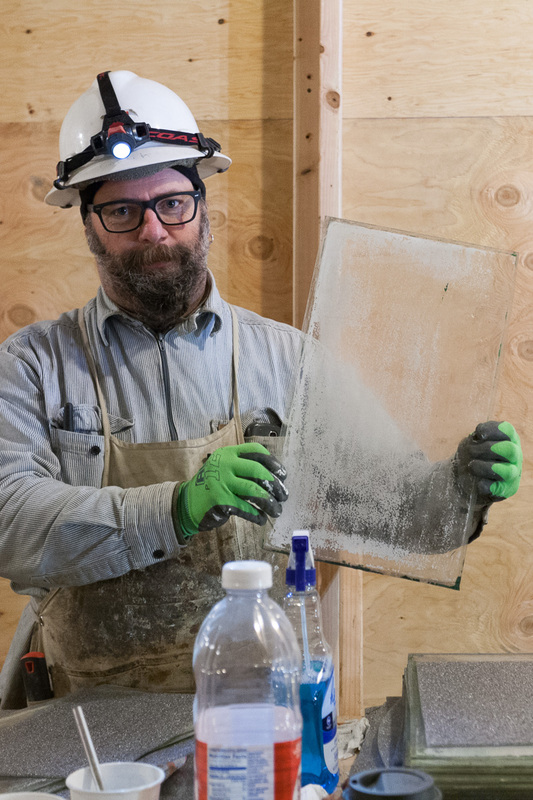 We've finished seismic and structural upgrades and are moving on to restoring windows, applying drywall, and prepping for installing the elevator. Above: Carpenters have built a new, level floor in the main theatre that meets up with the stage. 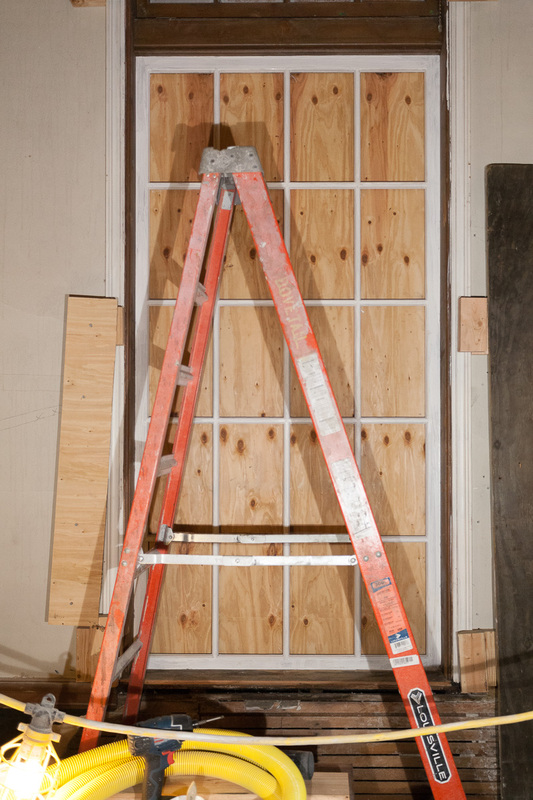 New side-doors have been cut on both sides of the proscenium arch. Above: The third floor theatre has been transformed into a full window restoration operation. In the background, newly restored windows are masked, primed, and ready for paint. Far left: The restored window frame is repaired of rot and primed. Middle left: Carpenter Peter Church cleans each pain, which is covered with about a hundred years of grime. 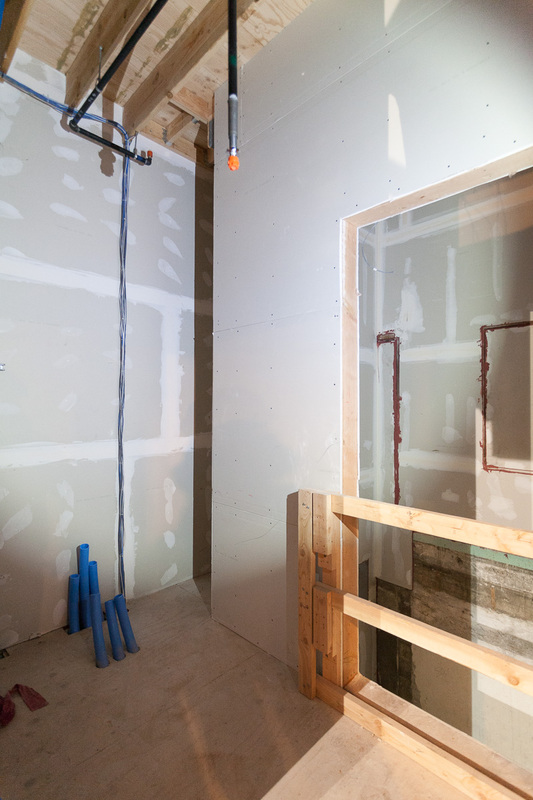 Middle right: The newly hung drywall in the elevator shaft. Far right: Hanging drywall in the basement. 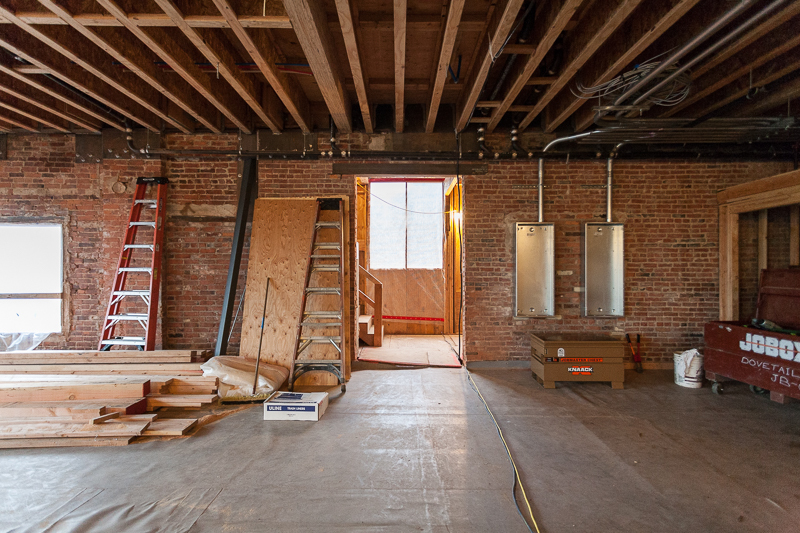 Located on Old Ballard Ave, the new C&C Lofts project, with architecture by Richartz Studios, consists of a tenant improvement build-out within an existing structure - a beatufiul old brick building - and new construction on top of that. The second story of the historic structure will become commercial space and above that a we're building two new two-story loft apartments with views of Magnolia and the Olympics. The 1960s were difficult for this building. Originally built in 1910, using free standing masonry, it was remodeled in the '60s and covered in a stucco veneer. Above: This is the same building as above, but stripped of the sad 1960s remodel. 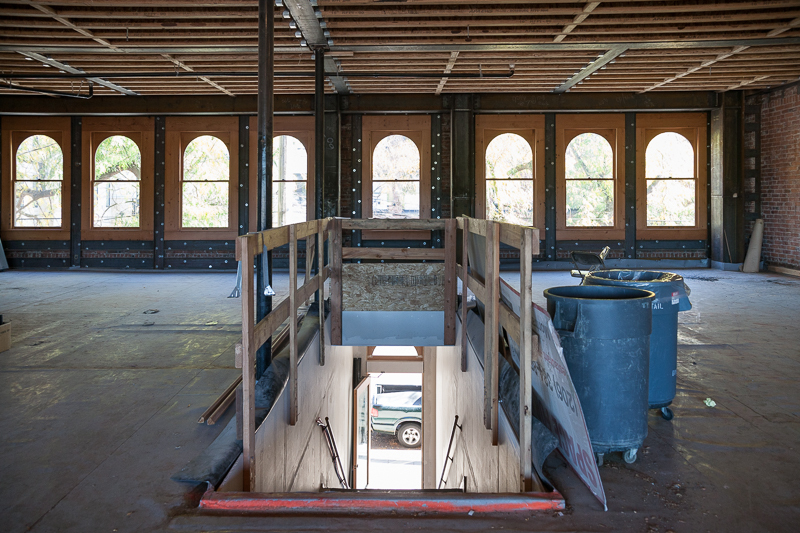 Restoration began on this historic building in 2015 - stripping off the stucco, providing seismic upgrades, reintroducing expansive commercial storefronts, as well as restoring the brick facade, wood cornice, and arched windows. 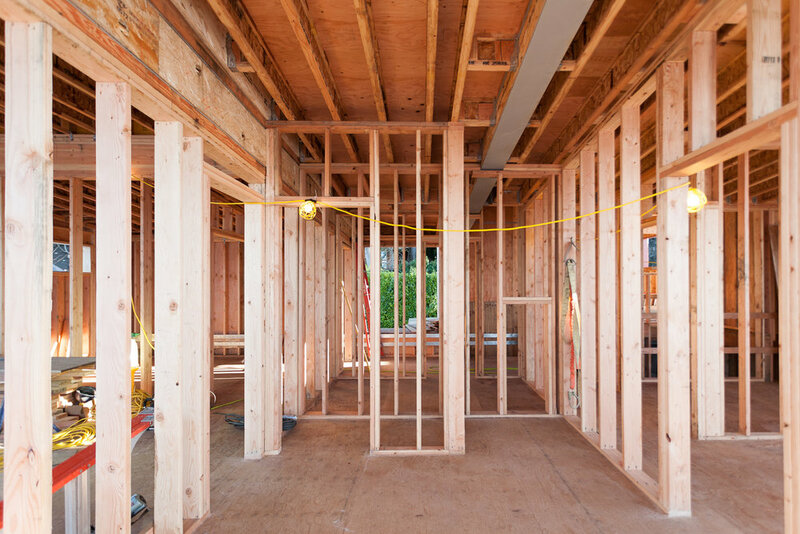 Dovetail is renovating the second floor and constructing two new two-story loft apartments on top of the existing building. Far left: The stunning bank of arched windows on the second floor of the historic building. Middle left: We're upgrading electrical service to the building. Middle right: On the third floor - one of the new double-height loft apartments with massive windows. Far right: The fourth floor private terrace overlooking Old Ballard Ave.
We're building a glass art gallery downtown for Lino Tagliapietra, who mentored Chihuly. Designed by Graham Baba Architects, the 6,600 square foot gallery features a large sky light or "light monitor," and a new 11 foot entry door. Above: The scaffolding and elevated platform for cutting a penetration in the roof and building the 45' x 16' light monitor. 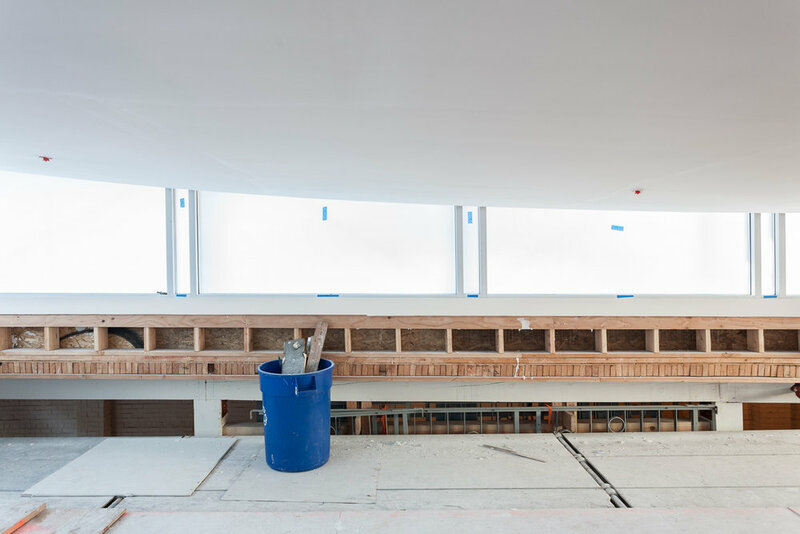 Above: The suspended ceiling of the 45' x 16' light monitor has a gentle radius, from which art will be hung. The platform and scaffolding are soon coming down. Far left: The exterior of the glass gallery on 2nd Ave. Middle left: The gentle curve of the suspended ceiling in the light monitor. Middle right: We've ripped up the old floor and exposed the original fir sub-floor, which will be covered in 8" white oak flooring. Far right: Meanwhile, at Dovetail's metal shop, Billy Musselman (L) and Kelly Gilliam discuss the new steel frame for the entryway, which supports an 11-foot-tall side light and custom wood door that's offset with a pivot hinge - a custom collaboration between our metal and wood shops. 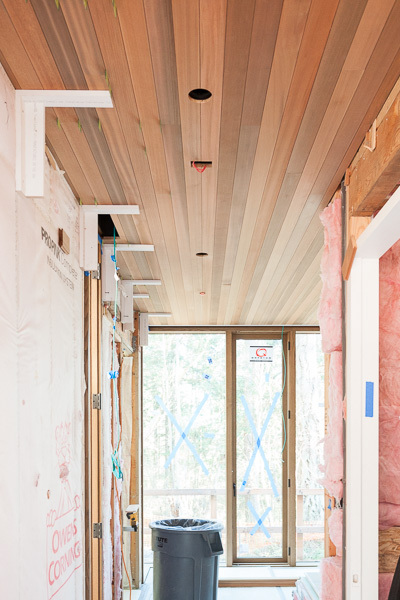 In this multi-structure residence, designed by MW Works, carpenters are installing the cedar plank ceiling throughout the main house, and prepping for applying plaster in the bunk house. Above: View of the main house, which sits at the edge of the forest, overlooking a pasture and pond below. Above: The bunk house and a newly poured concrete wall that will be clad in stone. 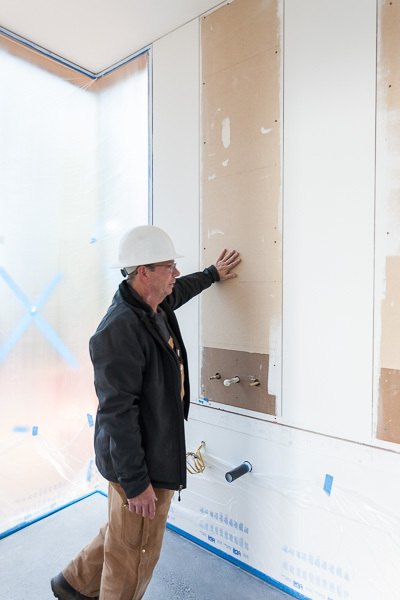 Far left: Superintendent Larry Bower explains that the MDF is a placeholder for mirrors, which have the 1/4" reveal on all sides, and align flush with the drywall. 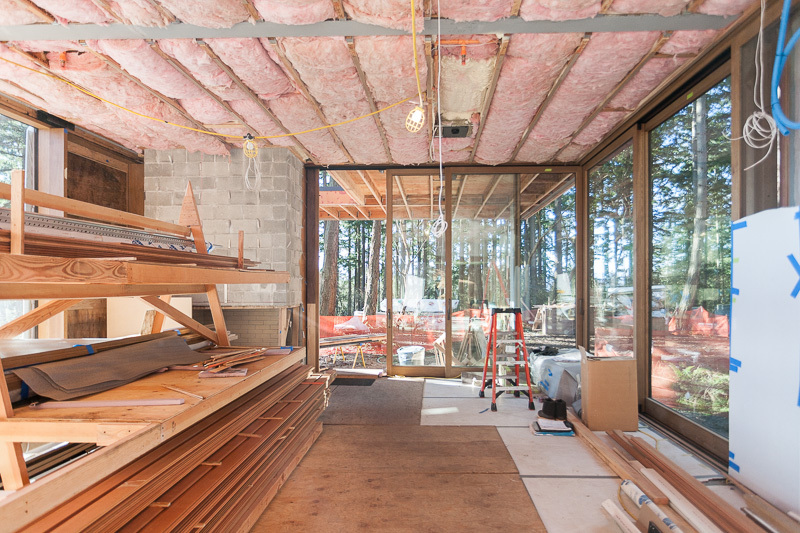 Middle left: Carpenters are installing the cedar ceiling - the joint between the boards aligns with the center line of the can lights and sprinkler heads. Imaging how many moves ahead we had to work in order to execute this perfectly! Middle right: Carpenters Joel Janes (L) and Chris Rion calculate the datum line before applying flashing to the sub-fascia. Far right: The open corner window in the living room, custom made by Quantum Windows. Meanwhile, back at Dovetail's wood shop... Left: cabinetmaker Brooke Nakhuda fabricates drawers. Middle: Nakhuda attaches the drawers to the a queen size bunk bed. Right: Five down, one to go. Our wood shop is fabricating all six bunk beds for the bunk house. The glass house on the prairie, peaking out from the edge of the woods.